FIRST OF ALL (yes, I’m shouting), thank you for all of the love, support, prayers, good wishes, emails, and letters I received following last week’s post. They have buoyed me up and I’m in a much better place mentally. You’ve fired up my fighter attitude and I’m feeling much more like myself— maybe even a new and improved version, in spite of this medical challenge. I’m sure there will be ups and downs, but it’s great to feel “up” after a long(ish) spell of “down.” I have an appointment with a specialist on June 9th (navigating the medical world has been a lesson unto itself), and my symptoms seem to be diminishing a bit (shhhhh…don’t jinx it). I’m very, very grateful for all of the above. 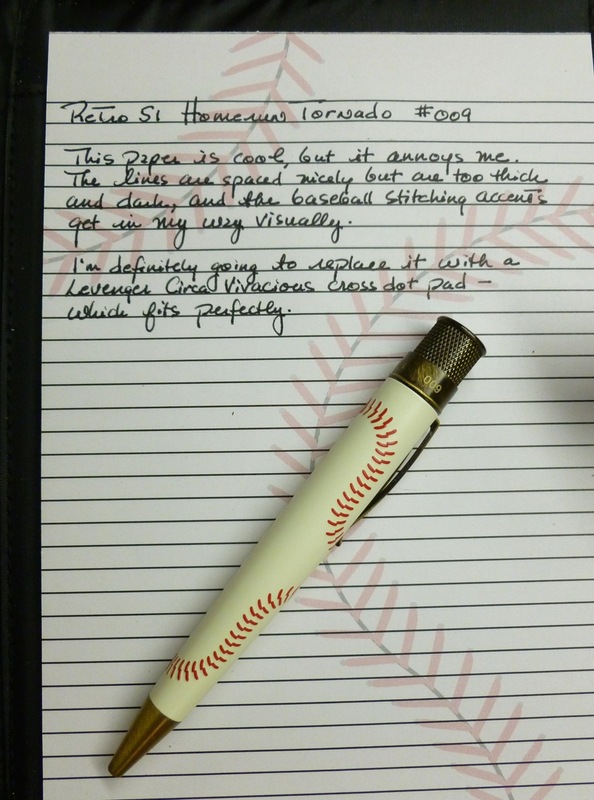 This week I really WILL take a look at the Homerun Tornado by Retro 51 that I pictured at the beginning of last week’s post. 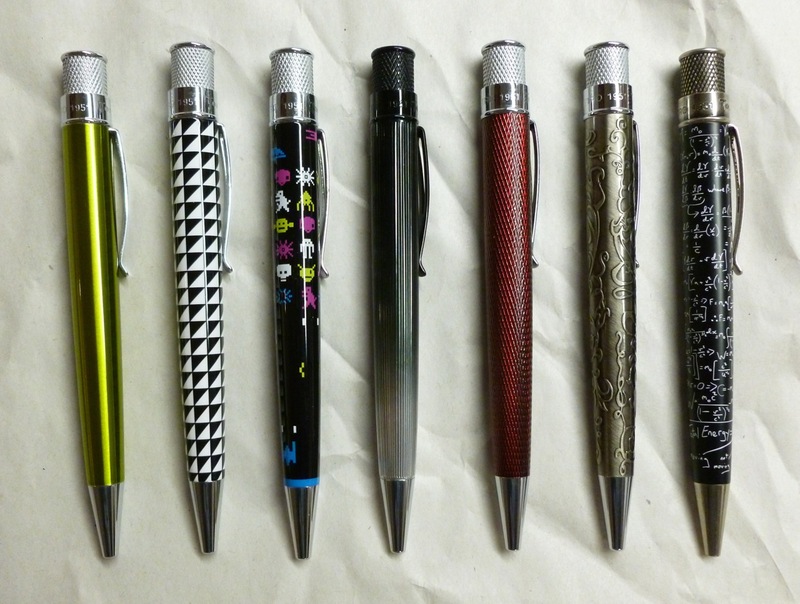 As with all Retro 51 designs, it’s a cool pen, with fun details, and a reliably good rollerball writing experience. It’s almost summer. Let’s have fun, no matter what life throws at us. 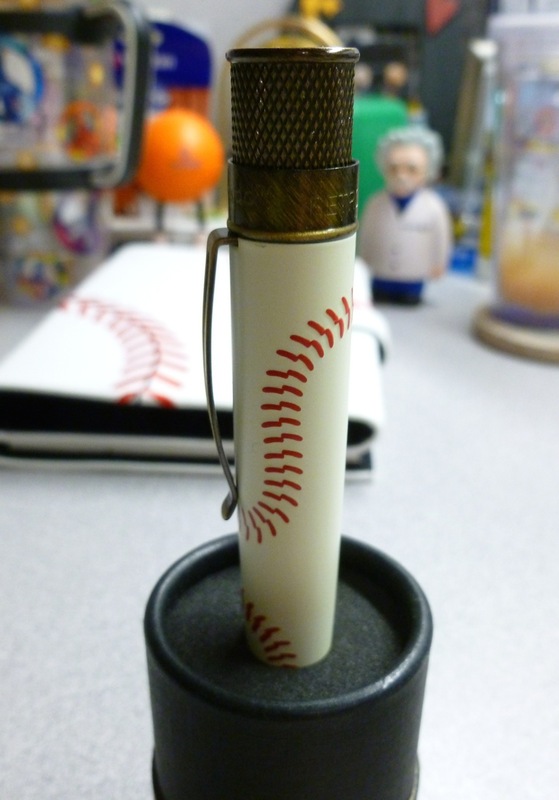 Maybe my favorite feature is the baseball design at the end of the pen’s twist-mechanism. I’m no baseball fanatic, but I love this level of detail and whimsy. 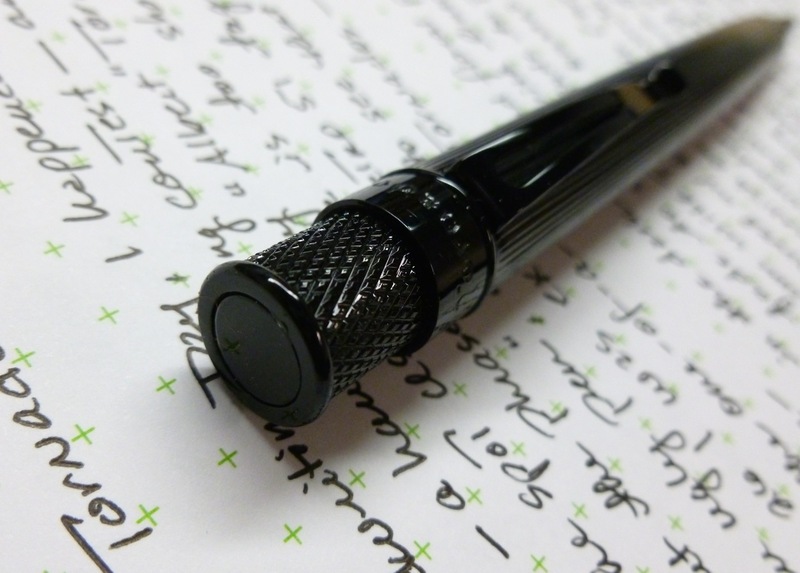 As always, the knurled mechanism twists smoothly to extend the rollerball refill’s writing tip. This is a solid beefy pen with a sense of fun. The simulated stitching on the pen is raised ever so slightly, so that the pen barrel feels just a little bit like an actual baseball. Great choice to not just have the baseball-like graphic, but also the feel. 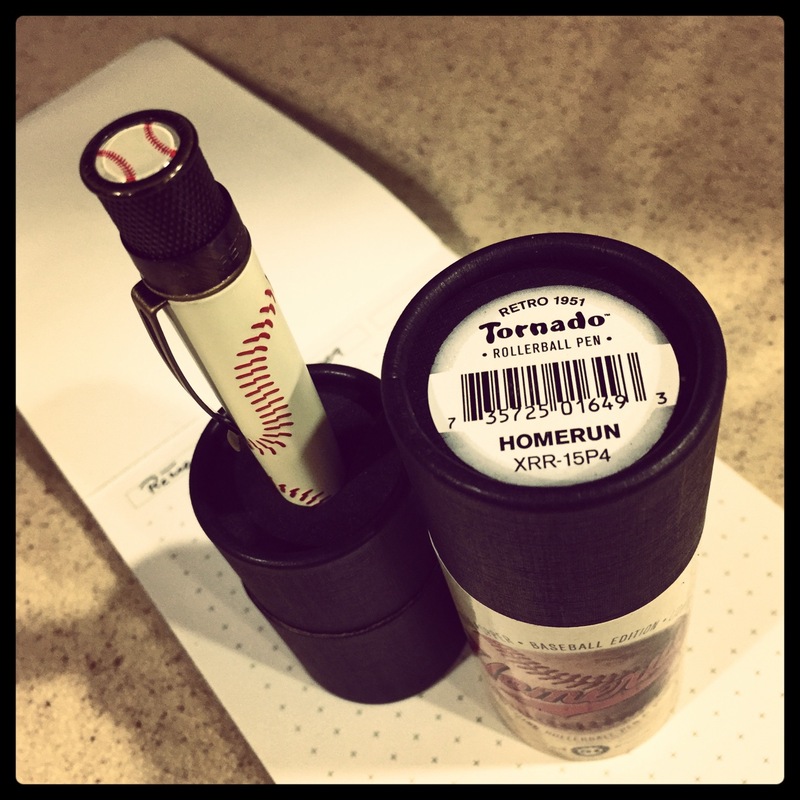 The Homerun Rollerball is limited to a run of 750 numbered pens. I happened to receive pen #009, by some stroke of luck. 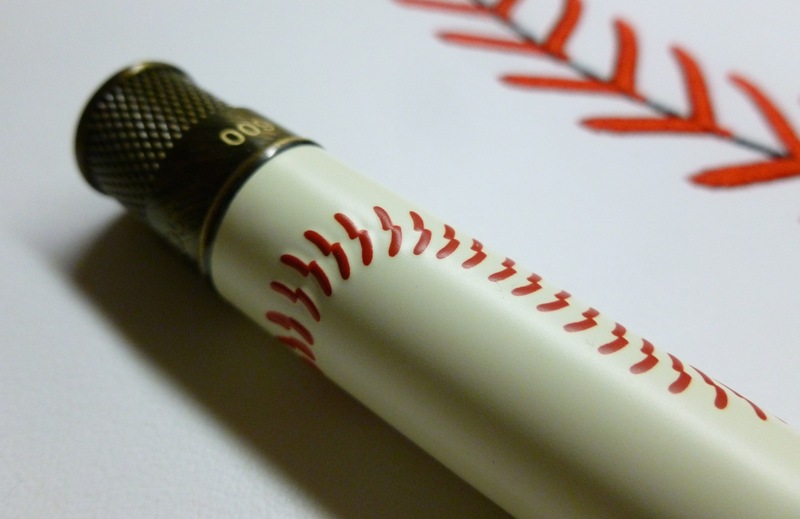 Cool number for a baseball pen! As I said, I’m really not a huge baseball fan but because we live less than an hour from Cooperstown, NY— which also happens to be my father’s hometown— we visit there often and are members of the Baseball Hall of Fame. 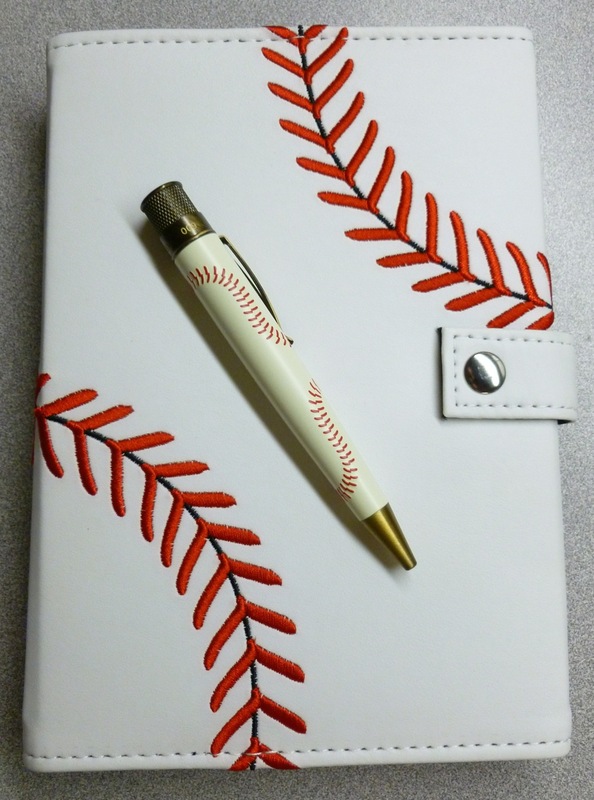 On a recent visit to their gift shop, my eyes fell on a baseball-themed folio that pairs perfectly with my Homerun pen. With our member’s discount, it came to about $9.00. Quite the deal. The paper inside is well-intentioned in its baseballness, but, frankly, bothers me. The lines are perfectly spaced, but are too dark. The stitching graphic looks neat, but gets in my way. No worries, though. 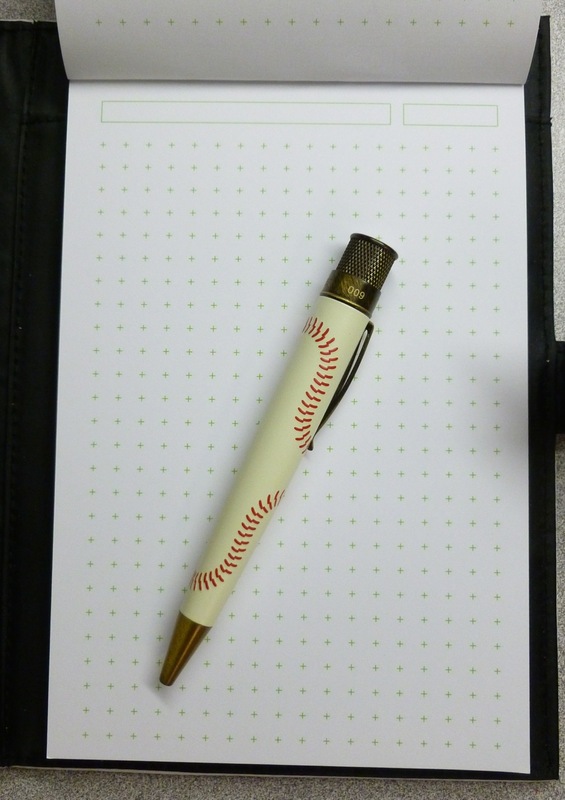 My all-time favorite Levenger Vivacious freeleaf Cross dots note pad fits like a glove (baseball glove?!) so a swap will definitely be made. The included refill writes on the broad side, but I’m okay with that—especially on the Vivacious paper—so I may resist the urge to make my usual swap to the finer Schmidt P8126 refill. Sometimes I like a super smooth thick black line. Retro 51 knocked this design out of the park, and you have done the same for me. It’s been a weird week/month/year. Since the beginning of April, I’ve been experiencing strange and spreading numbness in my right leg and odd sensations (like walking on electrified sandpaper) in both feet. At first the sensations were faint and I blamed them on the fact that I’d lifted a number of 5-gallon cans of solvent at work. Heck, so did the doctor for awhile. But then the odd feelings intensified and really took root, and I pretty much knew something bigger was up. I won’t go into all of the details, but let’s just say that the last five weeks have been filled with battles for appointments that weren’t two months away, fear and tears, more MRIs than seems safe, good news that turned out to be wrong (“It’s a pinched nerve in your back.”), and ultimately, a fairly sure diagnosis. Last Thursday I learned that it’s quite certain that I have MS. I have to say that I sort of saw it coming as the days passed and symptoms stayed. But still, it’s a lot to take in. I’m in the process of getting a referral to an out-of-town MS Clinic and I really can’t wait to get there so that I can finally feel like I’m taking action while, hopefully, beating back my symptoms a bit. Family and friends (and pets) are what’s most important. This becomes crystal clear very quickly. Don’t sweat the small stuff…or even the big stuff. Enjoy the sun, a walk, a movie, a letter, a book, lunch with a friend. Like I said, trite stuff that I knew but didn’t really KNOW until now. My biggest fear is that I’ll lose the ability to write. My pens and pen friends and letters and journaling (sporadic as it is) have become such a big part of my life—a place that I draw calmness and strength from—that I worry (see? I can’t stop) that MS will affect that. Maybe it’s fitting that my Retro 51 “Homerun” Tornado arrived during all of this. Maybe it’s a sign. On National Handwriting Day (January 23rd), I stumbled upon a Retro 1951 contest where a couple of prizes would be awarded for good handwriting while a few more would be randomly chosen. The prize? One of four one-of-a-kind Retro 51 Tornados, or the Goncalo (wooden) Tornado, AND a Retro 1951 t-shirt. This one-of-a-kind pen was produced by the factory, but never introduced into the Tornado line. Which seems a shame because it’s super cool. Featuring pitch black knurling and clip, the color of the barrel gradually fades into shiny silver. 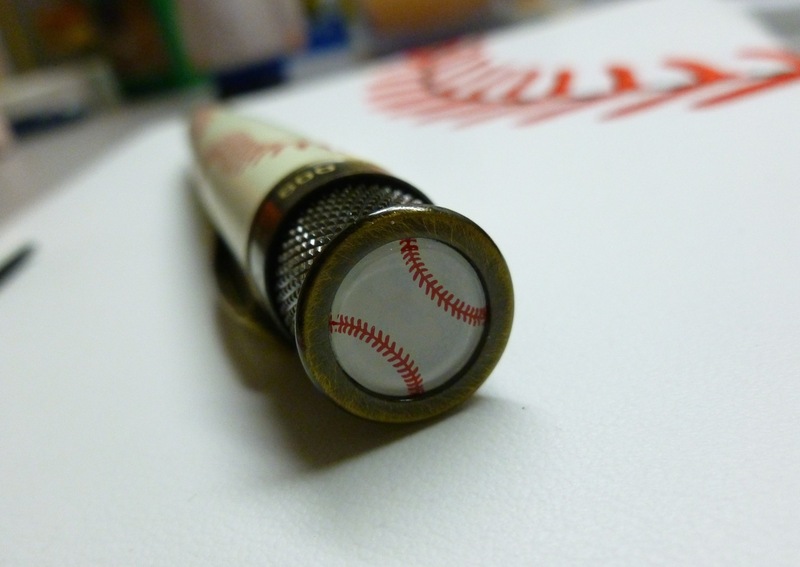 Toss in the line cut barrel, and you’ve got yourself one stunning, great feeling pen. It’s stealthy AND shiny— a very unique combination for a very original look. The Black Fade to Silver Tornado is a pen that I think would do exceptionally well in the Tornado line-up (and the comments on my Instagram feed seem to back this up). Hint, hint, nudge, nudge. Retro 51 is a company that does so many things right. 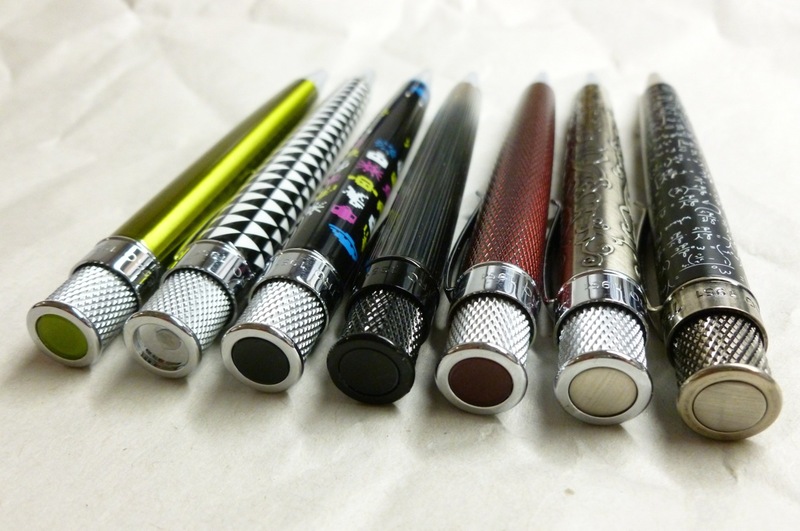 At a time when we’re hearing of more and more pen companies leaving the customer out of their business decisions, Retro 51 regularly engages their fans with contests and requests for ideas and feedback. By regularly introducing new designs (wallet draining designs), the offerings remain fresh—with something for just about anyone. Whether you want something simple, textured, wooden, humorous, or even glow-in-the-dark, there’s a model for you…or there will be in the near future. Much like the Field Notes Colors subscriptions, these are pens I can’t resist even though I have PLENTY. Maybe even PLENTY times 2. The shape of the pen may stay the same, but no two pens look alike. In the handful of Tornados shown above, there’s superb variety— a simple lacquered Kiwi green Tornado, a glow-in-the dark Zag, the playful Space Invaders model, my prize pen, the gorgeous Monroe, the textured Franklin, and chalkboard-like Albert. 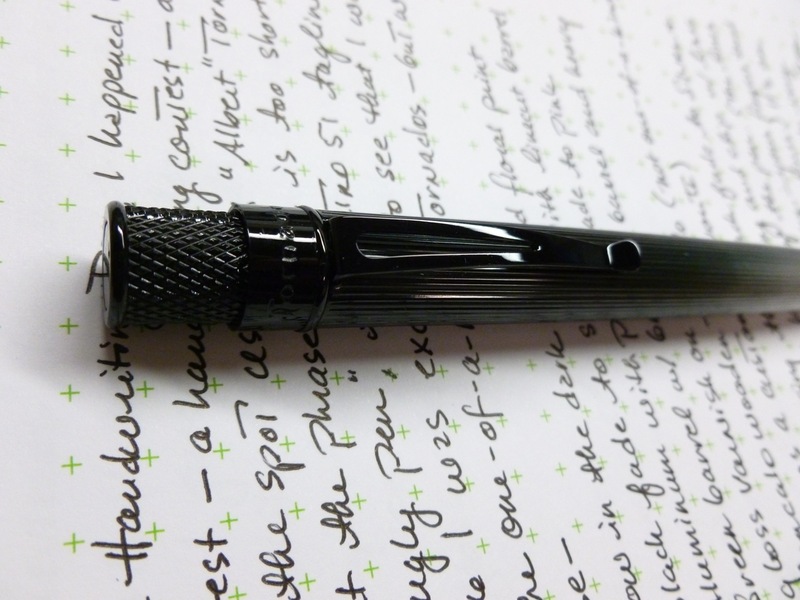 The Tornado’s knurling is a constant, as is the great writing experience. 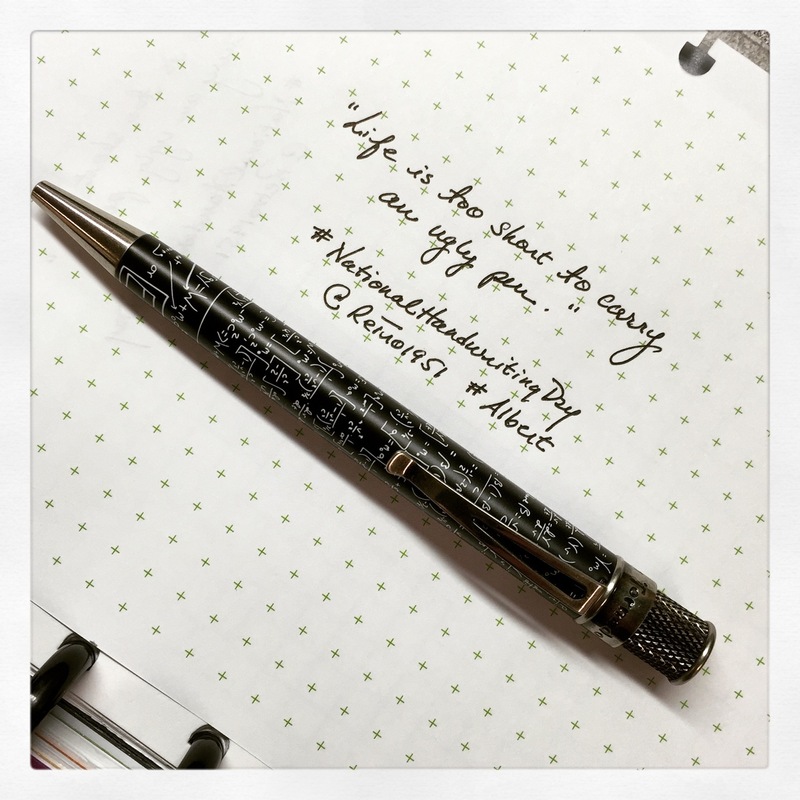 Whether you’re using the pen with the included rollerball refill, swapping in the slightly finer Schmidt P8126 rollerball refill or a Schmidt EasyFlow 9000 ballpoint refill, you’ll find the writing experience to be dark and rich. 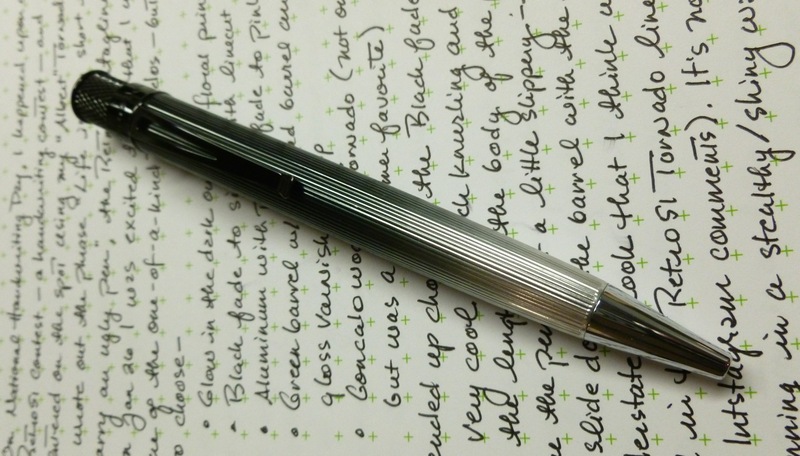 The pens are addictive—in build quality, in smoothness, and in looks. Oh, and in affordability, too. 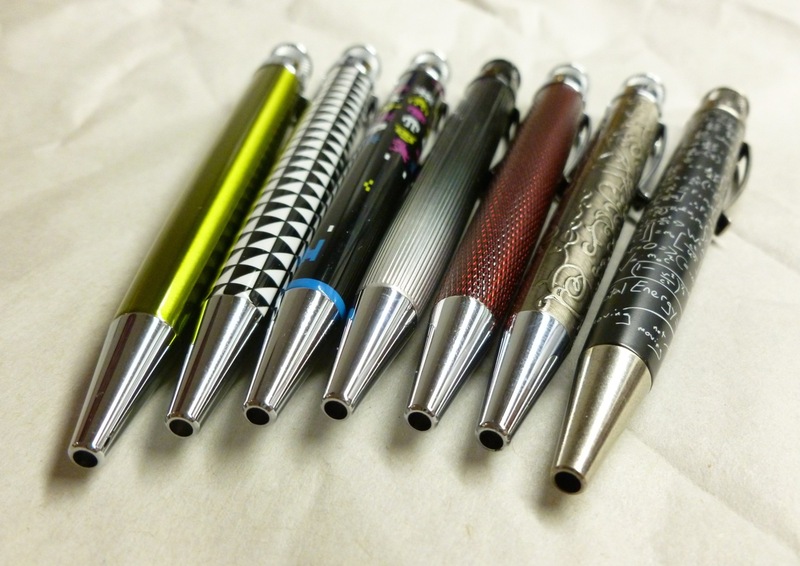 Retro 1951 is a company that does things right—from maintaining high quality standards, to building great looking pens, while also actively and regularly engaging their fan base. 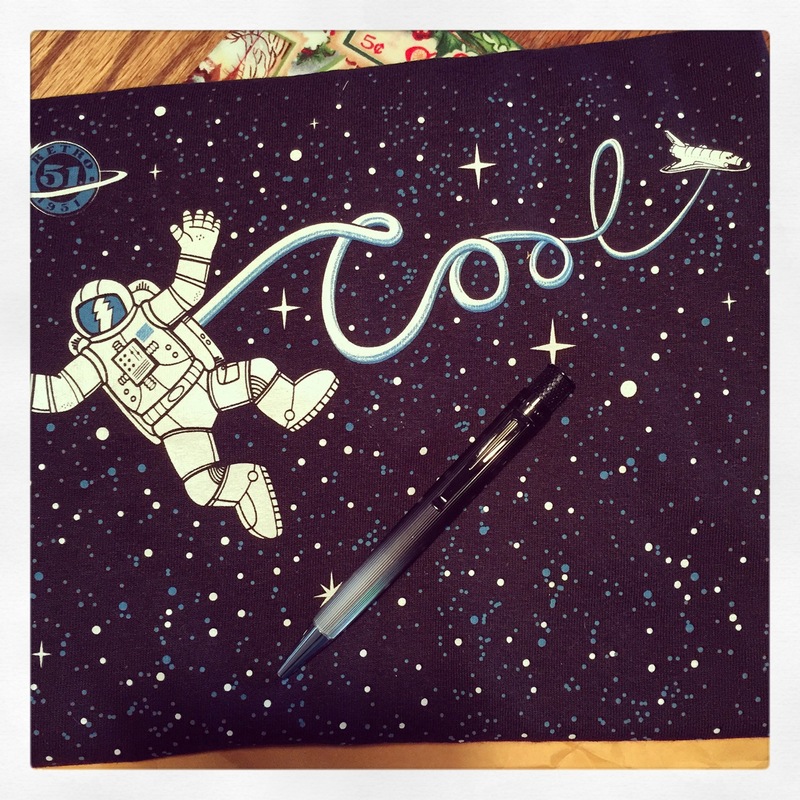 Am I biased because I won a pen— a very cool pen? Probably, but I’ve been a fan for a long time, as evidenced by my sizable collection. Life IS too short to carry an ugly pen, OR to deal with an ugly pen company. With Retro 1951, you don’t have to worry about either. Cool pens. Cool company. Which is why this t-shirt is so fitting. Thank you, Retro 1951, for my prize, and for being…well…cool.